The shaking came at 3:20 am — a rude awakening by any standards. Raymond Prather felt the rolling, the tossing - 20 seconds in the throes of seismic violence. Prather sat upright in his downtown Vallejo apartment as the rolling back to fade away. 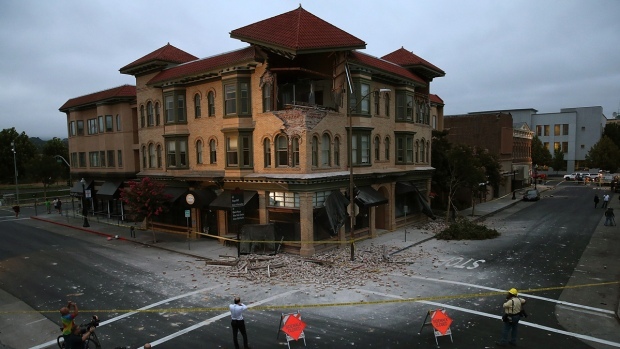 Napa and Solano Counties had been hit by a magnitude 6.0 earthquake, wreaking a swath of damage in its wake. As the one year anniversary of the South Napa earthquake approaches, folks impacted by the 6.0 temblor are bracing for an emotional day. Jodi Hernandez reports. A block away from Prather’s apartment sat the Victory Store, the Army surplus shop his grandfather opened in 1945. Upon arriving in his store, Prather discovered it mostly in tact - a fact he credits to the store’s post-Loma Prieta earthquake Retrofit. The day of that quake, Prather’s father who was behind the counter, watching as the walls began to heave and moan. By the end of the day on August 24th, 2014 Prather figures he earned a cocktail or two. Soon after checking his store, he was informed his apartment building had been red-tagged because of the badly crumpled department store one building over. As he headed home to fill an Army duffel bag with clothes, the fire marshall told him he had ten minutes to shut down his store, which was also now red-tagged. The store only remained closed for two days but Prather had to move into a hotel. Prather recalled the early morning hours of the earthquake; bricks from the nearby First Methodist Church had cascaded down, forming a debris pile on the sidewalk. The town’s U.S. Post office looked as if it had been plowed into by a truck. The roof of the department store next to his apartment had buckled and surrendered - tumbling down into the lower floors. It's been six months since the 6.0 Napa earthquake struck and a lot of repairs are still needed in the region. Jodi Hernandez reports. Chimneys tumbled in the shaking — leaving telltale mounds of bricks in residential yards. On Mare Island, historic homes and maritime industrial buildings suffered extensive damage. Ryan Gibbons and his girlfriend were tossed out of the bed of their Mare Island home. Gibbons had recently opened Mare Island Brewing Company in one of the island’s industrial buildings. Immediately following the earthquake, Pastor Al Marks of First Baptist Church gave his building a good once-over, heaving a sigh of relief at finding little damage. That morning the congregation gathered in the church for service. The following day, Marks relief blew like a belabored exhale. The scene became one of Vallejo’s most tense story lines in the disaster. 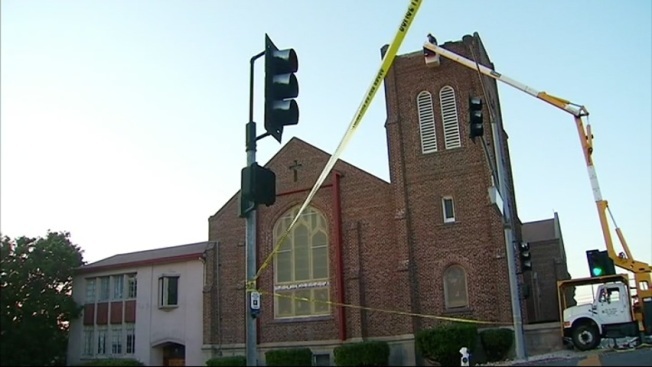 The church’s bell tower was thought to be in danger of collapse. Police taped-off Sonoma Boulevard as news crews and observers came to watch the unfolding drama. Crews in cherry pickers peeled away loose bricks — eventually removing the bell tower’s top parapet. The congregation was allowed to return to the church. Marks said the final work on the bell tower is still months away. A year after the disaster, it is difficult to see many signs of the quake’s path of destruction. A blue tarp remains on the heavily damaged department store. Beyond that, ongoing earthquake-related repairs are only visible to the learned eye. Vallejo City Manager Daniel Keen said in the wake of the disaster, the city issued 364 permits were issued to businesses and residents. Prather leaned against the front door of the Victory Store, watching a woman jog by. He said the sight of joggers in downtown was a new phenomenon — a symbol of the once-bankrupt town’s rebirth, mostly due to its lower housing prices which pale in comparison to San Francisco and Oakland. A new post office had since opened down the street and a new wave of businesses was popping up all over downtown. “I don’t think there’s any signs of the earthquake damage anymore,” Prather said before heading inside.